What a strange and wonderful monument at the heart of Paris that honors France's fallen soldier, particularly during the Napoleonic Wars. On the inside top, a list of Generals and wars fought; underneath, the tomb of the unknown soldier from World War I. Access is via an underground tunnel, thank goodness, as the circling drivers mad. I see two near collisions while another attempts a dramatic inside-to-outside move that earns little respect: "connard!" 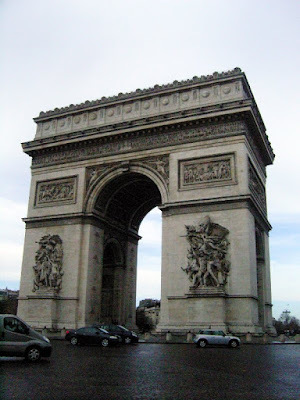 The Arc commissioned in 1806 by Napoleon after Austerlitz - laying the foundation took two years - and completed in 1836 delayed by changing architects and the Bourbon Revolution which stopped things cold. In the end, Napoleon had his satisfaction as his cold dead body passed underneath on December 15, 1840, on its way to the Invalides. I learn that in '61 JFK and Jacqueline Kennedy paid their respects at the Tomb of the Unknown Soldier, accompanied by President de Gaule. After Kennedy's assassination, Jacqueline Kennedy remembered the Arc de Triomphe's eternal flame and requested an eternal flame be placed next to her husband's grave at Arlington National Cemetery. President de Gaulle went to Washington to attend the state funeral and witnessed Jacqueline Kennedy lighting the eternal flame that was inspired by her visit to France. So back to London and without fail, rain. I have never lived in a climate like this. England is not like this. We celebrate life with our friends Jan (Dutch) and wife Nes (Turkish) drinking martinis and talking late.